Esschert Design Large Round Plant Trolley, Brown, 13" dia. Rest a potted plant on a classic and lovely base using this Esschert Design Large Round Plant Trolley. Elevating your plant on a caddy not only provides a place for water to drain; it also allows air to circulate all around your flower or herb. A bevy of scrolls and curls creates the center of this caddy, bringing an ornate look to your patio with ease. 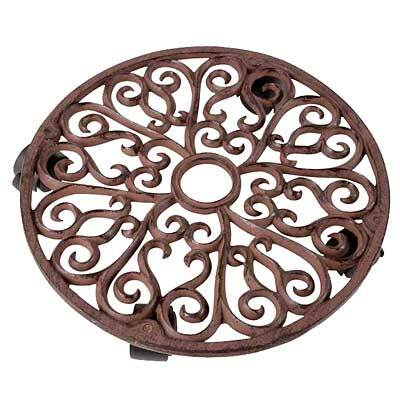 The 13" diameter frame holds medium or large pots handily, and the cast iron construction provides seasons of service. The distressed brown tone further celebrates nature, and four plastic casters make it simple to reposition the unit. Two of the casters lock, helping keep your plant in its place. Bring height to your potted plant with this Large Round Plant Trolley.